When are elections free and fair, according to corporate media? When the US government says they are. The May 20 Venezuelan presidential elections pit Hugo Chavez’s successor, President Nicolas Maduro, against opposition challenger Henri Falcon. Maduro has called for the United Nations to observe and oversee the contest. Despite calling for elections throughout 2017, many local opposition groups, together with the US government, have demanded no observers should come, arguing that it would “validate” the elections, and have preemptively decided they will not recognize the victor. 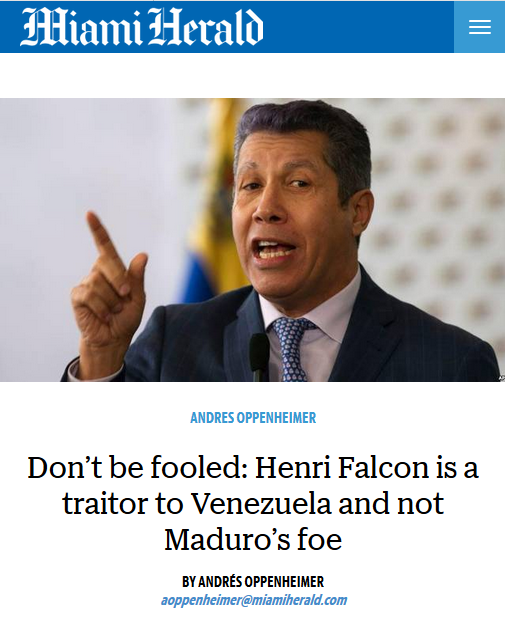 The US State Department (2/8/18) has cast doubt on the validity of the elections, claiming they represent a “dismantling” of Venezuela’s democracy, as “they do not have the agreement of all political parties.” That the country is ruled by a dictator presiding over fake elections is taken as a given by corporate media; the Miami Herald (5/2/18) declared the contest “fraudulent,” a “sham,” a “charade” and a “joke” in one column alone. 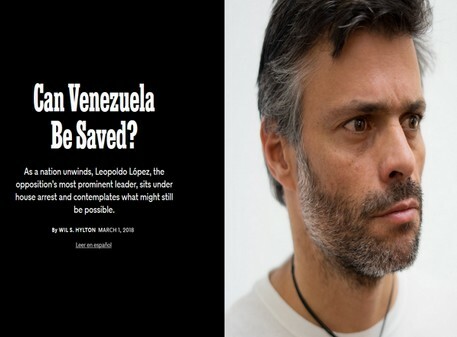 The major argument for this declaration is the barring of certain candidates from running, chiefly Leopoldo Lopez, (pictured above). Glossing over or simply not mentioning these key details in a 9,000-word puff piece, the New York Times Magazine (3/1/18) presented him as a Christ-like figure, “the most prominent political prisoner in Latin America, if not the world,” comparing him to Martin Luther King. This is hardly the first time media have labeled elections in Venezuela a sham. As detailed in my new book, Bad News From Venezuela: 20 Years of Fake News and Misreporting, US media overwhelmingly presented, by a 12:1 ratio, the 2013 elections as unclean. The Miami Herald (4/13/13) claimed that there was “evidence that the country’s 2.4 million public-sector workers, and hundreds of thousands of government welfare recipients, were being pressured to vote along party lines,” and that “the media disparity is one of the most visible examples of the government’s campaign advantage,” with Maduro lording over a huge state media empire and the opposition “competing” on the “cowed” private media. "Unsurprisingly, polls show that Mr. Maduro will win this grossly one-sided contest. If by some chance he does not, the regime is unlikely to accept the results." This contradicted years of positive appraisals from independent observers like the European Union. An AGB Nielsen report on the country showed that the state accounted for less than 10 percent of the TV market. "We have many options for Venezuela, including a possible military option." 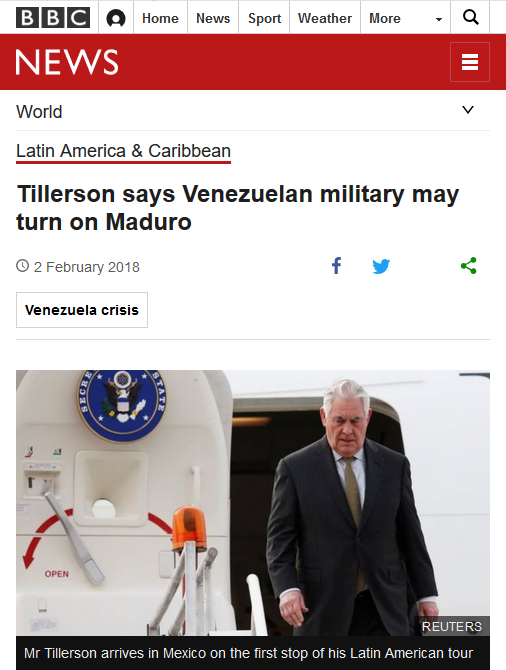 "In the history of Venezuela and South American countries, it is often times that the military is the agent of change when things are so bad and the leadership can no longer serve the people." "The world would support the armed forces in Venezuela if they decide to protect the people and restore democracy by removing a dictator." "The army does not at present seem to be showing signs of rebellion." Opposition on moral or legal grounds appears low to nonexistent. Previous FAIR studies found that 95 percent of op-eds expressed clear and open hostility to the elected government. Indeed, this is hardly the first time the media have supported a coup in the country. As Bad News From Venezuela catalogs, in 2002 the US trained and backed similar opposition groups, who, after deposing Chavez, then liquidated the Supreme Court, dismissed every elected official and began rounding up and arresting political and media figures who opposed them. "With yesterday’s resignation of President Hugo Chavez, Venezuelan democracy is no longer threatened by a would-be dictator. Mr. Chavez, a ruinous demagogue, stepped down after the military intervened and handed power to a respected business leader." "Mr. Chavez was a terrible leader. His senseless mix of populist and socialist decrees seriously damaged the economy and galvanized opposition." Writing in the New York Times (3/6/18), Henri Falcon has promised to open the country up to international agencies like the World Bank and IMF, and to dollarize the local currency, moves which are sure to be a bonanza for Western corporations. 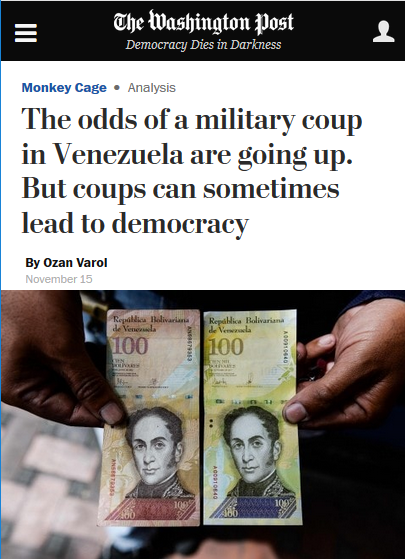 Nevertheless, some opinion polls show Maduro is the favorite to win, in part due to the highly unpopular opposition parties that even the Post (11/15/17) describes as “hopelessly ineffective.” Perhaps this explains why the US government and the media have already decided the whole process is a sham. Alan MacLeod (@AlanRMacLeod) is a member of the Glasgow University Media Group. His latest book, Bad News From Venezuela: 20 Years of Fake News and Misreporting, was published by Routledge in April.